With being in the wedding industry, we hear of many different types of weddings, such as, shotgun weddings. Have you ever heard of a cannonball wedding, though? Phelicia and Dan, who got married at Keswick Vineyards on Sunday, October 7, 2018, put on quite the show for their guests. 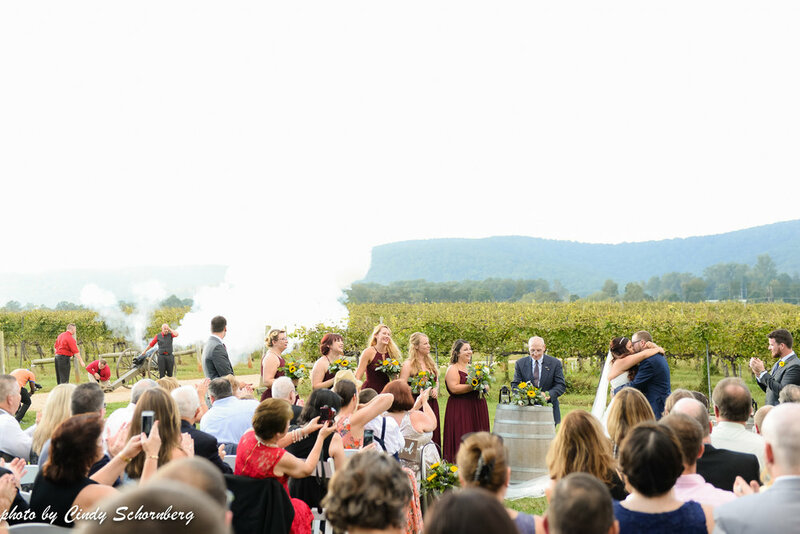 Both Phelicia and Dan are Civil War reenactors and decided to incorporate that into their wedding by having a canon go off when they kissed and then again when they lit it together as husband and wife. Even their cake was decorated with two figurines of them lighting a canon. The little touches that couples incorporate into their weddings always make a huge difference. Another aspect of the wedding that we particularly loved was the welcome board, made of wine corks and sunflowers (their signature flower) and pictures of the entire wedding party. It had a picture of either Phelicia or Dan with their friend in the wedding party, as well as, a label that stated how long they had known that friend for. 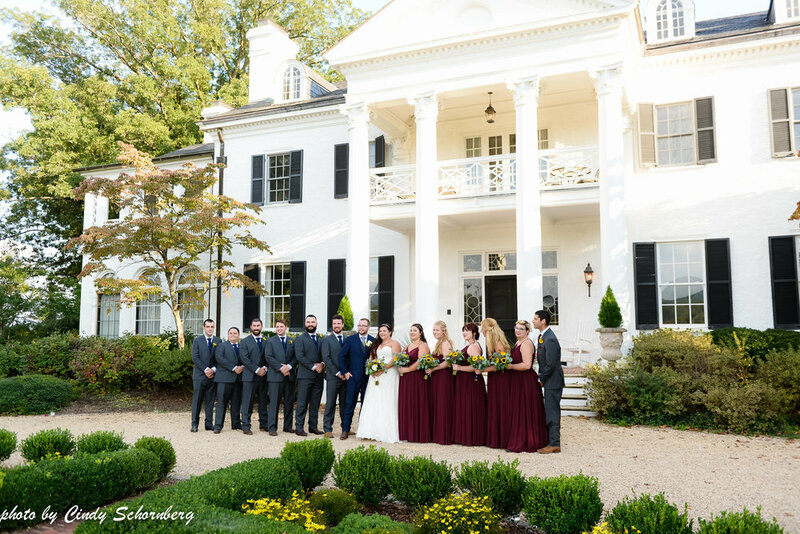 This is a great way for guests to know more about each individual in the wedding party and their special connection to the bride & groom. With weddings also comes alcohol. For those that had a little too much to drink, Phelicia and Dan had “hangover recovery kit” mason jars filled with whatever someone needs to combat a day of headaches and sickness. It was a fun idea, but we hope that not too many of their guests really needed it! Congratulations to you two, Phelicia and Dan. We hope that your “explosive love” never ends! Event Planner: Francesca Weiner, Officiant: John Yesko, Caterer: Goodrich Gourmet, Desserts: Delectable Desserts, DJ: Bob Mednikov, Photographer: Melissa Batman, Hair & Makeup: Jeanne Cusick, Florist: Colonial Florist, Transportation: Blue Ridge Tours, Camryn Limousine, and Albemarle Limousine, Lighting: Skyline Tent Company.